Use these steps to complete orders from your customers. 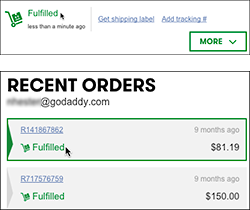 You can send them emails, fill orders, and view recent orders. In your Products list, click Online store and then click Manage next to the account you want to use. From the Sales menu, click Orders and then click a Paid order to see its detailed view. If you're satisfied that the order's ready to go, click Fulfill Order. 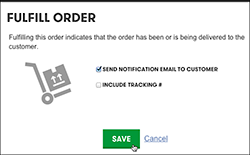 The Fulfill Order window opens and offers you the option of entering a tracking number manually or pasting in one provided by your shipper. Be sure to select Send notification email to customer before clicking Save. (Otherwise, the customer will not know that the order's been shipped). The order's shipping status will be displayed on the single-order page, as well as on the Recent Orders page. (The tracking number also is added to the single-order page where you can change it if needed).